The subject for this post is the Java Dequeue (https://www.hackerrank.com/challenges/java-dequeue/problem) challenge from HackerRank. 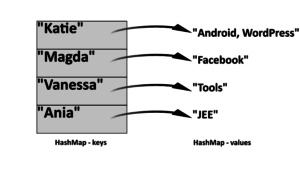 It is a mix of double ended (doubly linked) queue and hash map. The idea is to insert a set of n integers in a queue and then take m at a time to process. In other words, we need to set a window of m integers and check. On each pass we move the window once and check again. We repeat until all windows of m numbers have been covered. When done we display the sum of windows that hold all different numbers. The actual challenge seems to do a good job describing the requirements. There is only a single test example. In this solution I decided to use the suggested queue, a hash map used to decide if all numbers in a window are unique, and two iterators. I used an Iterator to move in front of the window and a second one to move behind it. All this was prompted by the note which specifies an execution time limit of 3 seconds. If interested, my entire solution generated in the Eclipse IDE can be found in my GitHub repository. If you have comments or questions regarding this or any other post in this blog, or if you have software development needs, please do not hesitate and leave me a note below. Requests for assistance will be kept confidential. Keep on reading and practicing, which is the only way to learn.